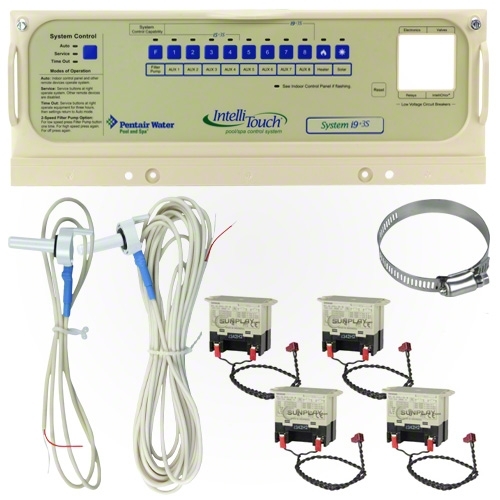 The IntelliTouch i9+3S Personality Kit is for use on pool or spa systems. The i9+3S is for pool or spa only (single body of water) applications and does NOT run pool and spa combinations with shared or dual equipment. An IntelliTouch control system takes the work and worry out of scheduling and operating pool and spa heating, filtration and cleaning cycles. It also gives you one-touch control over additional heaters, valves, pool lights, landscape lights, water features and more. At the same time, IntelliTouch makes sure all your equipment operates at peak efficiency for minimum energy usage and cost. It even helps protect your equipment investment. IntelliTouch senses conditions that could hamper operation and alerts you to these situations or takes automatic corrective action. All IntelliTouch Control Systems can be operated using various Interface Kits, Control Panels, Wired and Wireless remotes, iPhone Application, Screen Logic and even telephone remote control (Interface Kits, remotes and other control interfaces are sold separately).